Chöd is a living Buddhist heritage. The practice was founded almost a thousand years ago in ancient Tibet on the basis of Buddhist teachings, but it is still valid today. Machig Labdrön was born in Tibet in the 11th century of our era. She was an exceptionally gifted girl who chose the spiritual path very early on, and devotedly studied and practiced the Buddhist teachings, and as a young woman met several times with the great Indian master Padampa Sangye, who gave her important teachings and instructions. She created the practice of chod, which spread all over Tibet and India and made her famous as a great yogini, Machig Labdrön passed on the teachings of chod to her children and many students. Lama Tsongkhapa, the great reformer and founder of the Gelugpa school, promoted this practice and was concerned that the practice of chod as taught in his ancestral monastery Ganden was correctly passed on. Chöd, approaching wisdom on the altruistic path, Chöd means “cutting off”. The grasping after the self is cut off, which hinders us to gain profound insight. By overcoming selfish, habitual thinking and behavior, the natural openness, clarity and sensitivity of our mind can manifest itself, and in Ganden Chökhor the two Gelug lines of transmission are taught. The Venerable Lodrö Rinpoche studied and practiced both lines intensively. The two lines are equally effective. The texts are centuries old and give the practice an external guide, partly sung and accompanied by drums and bells. The beautiful old melodies as well as the drum and bell technique can be learnt, and the most important aspect of the chod practice is visualization. The altruistic attitude of selfless giving is at the heart of the Choir, and the practice can be refined and strengthened with the individual wisdom and compassion of the practitioners. In Ganden Chökhor, under the direction of Lama Lodrö Rinpoche, a multi-year training course on the theory and practice of chod. The courses are offered in various modules that build on each other. In Ganden Chökhor we offer training in the tradition of the Chöd. The goal is that the students learn to perform this practice independently with drum, bell, recitation and all visualizations. We offer training in several modules. Chöd (gCod, or Cö) arose from the desire to practice Prajnaparamita. Prajnaparamita is the central teaching of the Buddha Shakyamuni in which he taught on the summit of the Geiergipfelberg in front of a large crowd of listeners, how the phenomena really exist and how we can correct our false view of things in order to finally attain enlightenment. Macig Labdrön, the Tibetan yogini, based on these teachings, founded the practice of chod, which became a very effective Tibetan Buddhist meditation. In Ganden Chökhor, the practice of chod is taught according to the Gelug-Line. There are two traditions in this tradition, the Wensa tradition, according to the great master Wensapa Lobsang Döndrup, who lived from 1505 to 1556 and the Shiwa Lamsab tradition, the whispered line of the Dakinis. Both lines have their own inaugurations, practice texts and delivery lines. Both are taught by Lodrö Rinpoche. Practitioners who want to start with the Chod should have some knowledge of Vajrayana (Kriyatantra, Anuttarayogatantra). A certain stability in Dharma practice is necessary for the chod training. We recommend lectures and exercises as part of a course or retreat. The first step into the Chöd training is the heaven-opening inauguration, either according to the Wensa or Shiwa Lamsab tradition. The receipt of this initiation gives permission to listen to or read teachings on the Choir and to begin the practice of the Choir. At the beginning of each training module, Rinpoche gives an initiation into the respective tradition. In addition, it grants further initiations. The 9-day modules are structured according to a classic retreat with four sessions. 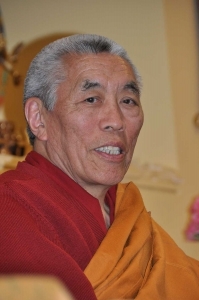 Each morning Rinpoche explains the practice or explains the theory of chod. In the afternoon, students go individually or in small groups to the nature, the forest or the mountains to practice chod in two sessions. In the evening, the group sings a choir practice, usually together with Rinpoche.